Home > Social Media > WhatsApp Blue Tick- No more pretension of not reading message but is there any loophole? Today morning WhatsApp gave us a new update which is both boon and bane at the same time. 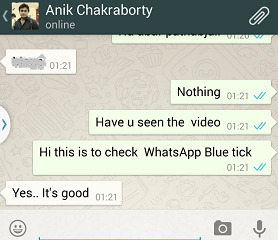 It is the WhatsApp Blue tick. Now what is this blue tick for? Previously when we used to send a message it showed a single tick to represent that the message has been send and a double tick to show that the message has been delivered. But it was confusing still to understand if the message has been received by the phone or it has been read. Other messenger service like Viber already included this feature long back that when a message has been read, it said “Read”. Finally WhatsApp has added this feature although quite lately. Facebook included the seen option in messenger and this is after WhatsApp’s acquisition by Facebook that it has started incorporating new features. Some more noticeable features that has been added in recent times is the enabling and disabling last seen option, hiding contact images, adding caption to videos and images. But the WhatsApp blue tick option added is precarious. Now you cannot pretend to have not seen the message in order to eschew your friends. But many of you might be thinking if enabling pop up notification can help you get rid of it? Well to disappoint you, it is not possible. Even if you tap the back button and do not touch the window, your message will be marked blue. You can check for yourself as I did. So there is no way out. WhatsApp has recently abandoned the monthly subscription which it claimed after one year of free service in the developing countries. this is one of the best thing happened in whatsapp. I thank the article publisher to bring it in such that even a nontechnical persons can known what he is telling. this is the great thing that whatsapp has done. It a boon as well as a bane. We can check who ignored our messages and who all read. I thank the article publisher for publishing this stuff…….